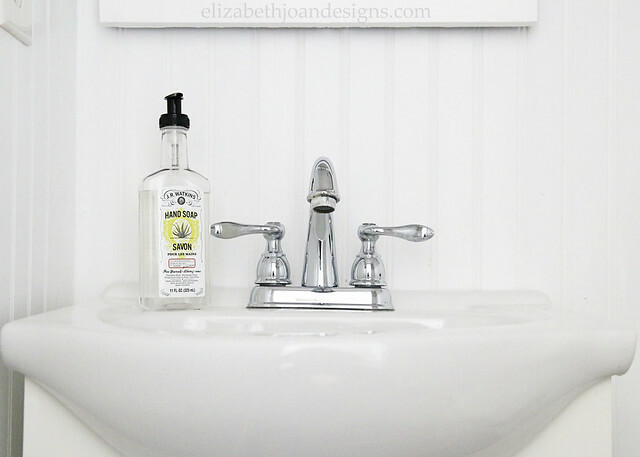 I must say that I am in love with our powder room. 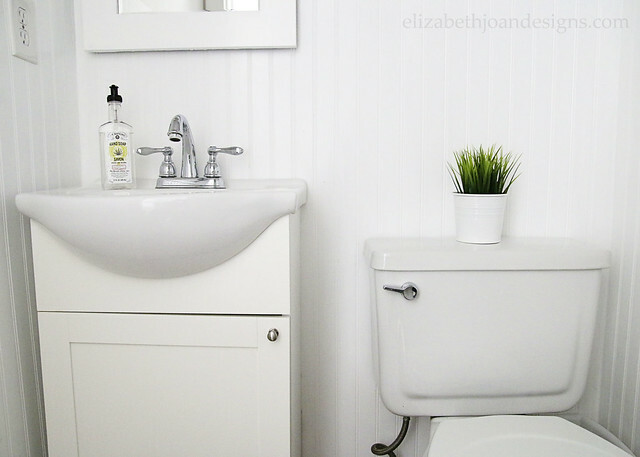 Currently, it is a calm, yet bright white/gray which makes the room feel bigger. It has been a rocky romance though, and only recently has this love come to fruition. We’ve owned our home for over 10 years and this tiny bathroom has seen many changes. When we bought the place, the powder room was painted blood red. No kidding. It was like Dracula’s dream paint color. After reluctantly living with that for a couple of years, we painted it a very pale gray color, which was nice. However, as luck would have it, we then moved away for my hubby’s job and renters moved in. Of course, we moved back a couple of years ago. 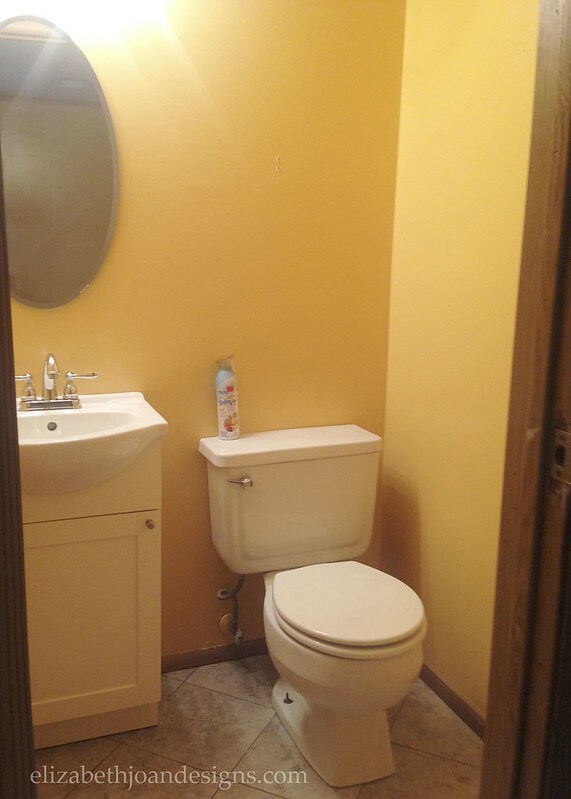 We had allowed the renter’s to paint the rooms and when we moved back in, the little powder room was painted a mustard yellow color. Not our style at all! As you already know, we are neutral people. Not that we don’t love color. We do! 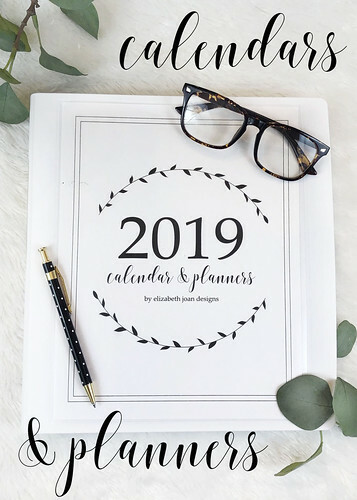 Just not for our walls/decor. So, we opted to paint the walls/trim all white, until we had time to really figure out what we wanted to do with the space. 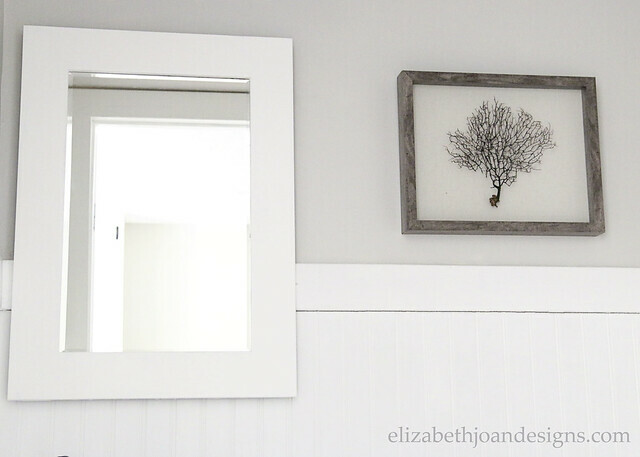 After a year and a half and a few other renovations (Kitchen, Breakfast Nook, Kids’ Room), we finally got around to fixing up the powder room and our initial plan to just paint it with Restoration Hardware Silver Sage changed. We pulled out everything, from the toilet to the lighting, replaced the flooring (it matches the rest of the first floor of our home), added beadboard to the walls, painted, and then put all of the necessities back in. 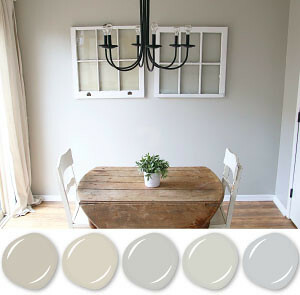 The upper wall color we went with is Benjamin Moore Gray Owl. 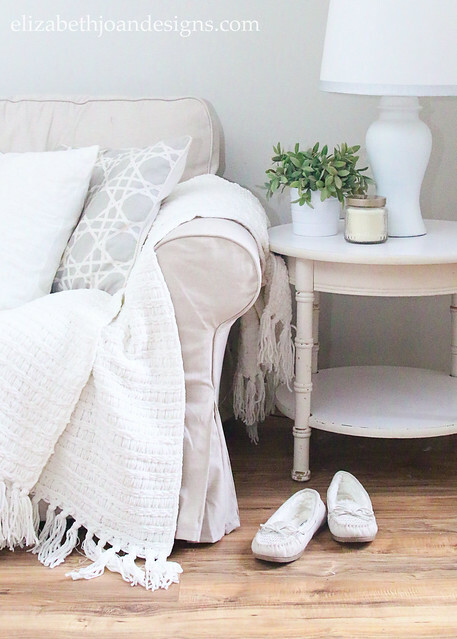 It is the perfect light gray paint color for this small space with no natural light and it looks really great with the white and wood tones in the room. 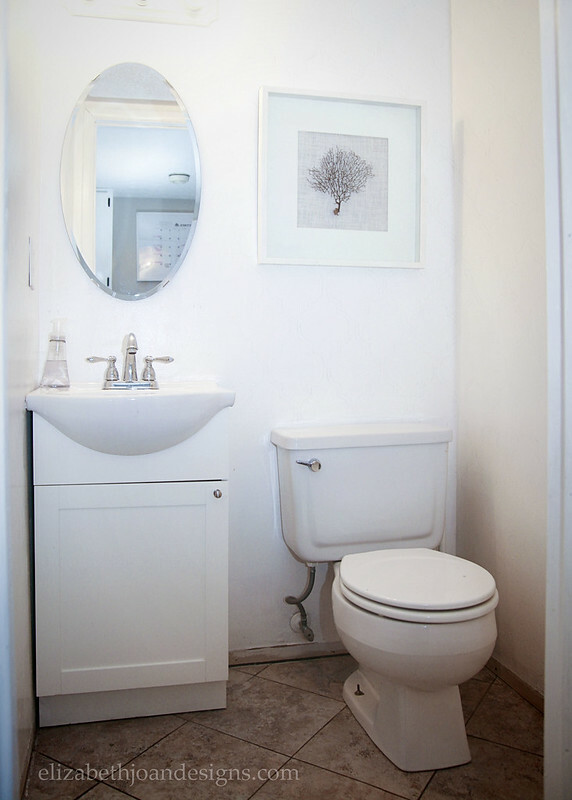 Since we didn’t want to spend a lot of money, we opted to add in a few new accessories (like the mirror and wood art frame) and keep the old sink and toilet that were already there. They aren’t anything special, but they seem to work nicely with the room. 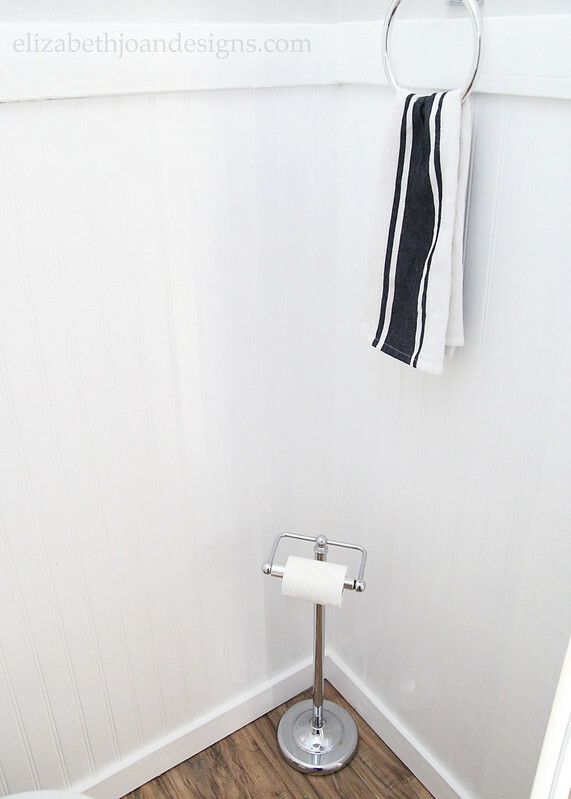 We didn’t want to add an attached toilet paper roll holder on the wall for fear of messing it up, so we opted for a freestanding option, which works just fine when you need to wipe your bum. Hehe. 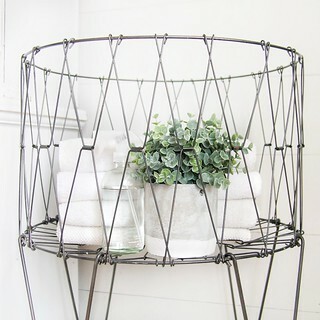 The powder room feels so fresh and so clean now that we have gussied it up! It is the perfect calming place to go when you need a bathroom break or a break from your kids, since the door locks. 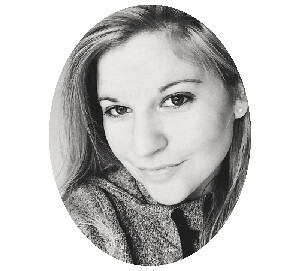 I may or may not have written this blog post in the powder room. 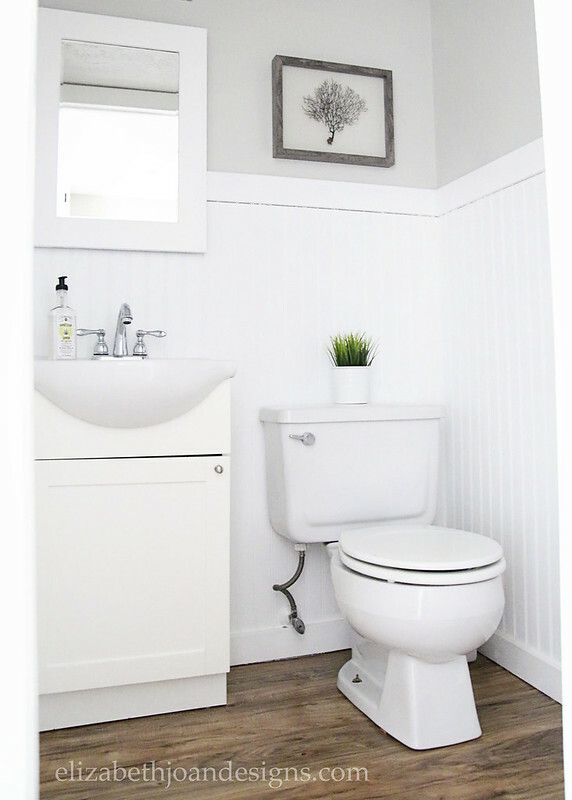 Loving this little room update – the white wainscotting and light gray walls are the perfect combination! Thanks, Nicole! It really brightened up the room. Glad you stopped by!